SaddleBack offers lessons 7 days/week, year-round & riders may start at any time! Beginner to advanced, child to adult, whether pleasure or showing competitively, SaddleBack’s instructors have the experience and knowledge to help riders reach their top potential as a successful rider. For those without a horse, a great selection of experienced, safe school horses are available for lessons, partial leases, and showing. SaddleBack currently offers 13 school horses ranging in size from small ponies to 17h horses--many winning multiple year-end awards & championships in hunter/jumper shows. For those ages 7 to Adult new to riding or wanting to ride after years off, SaddleBack offers highly-qualified instructors, well-trained school horses, equipment (helmets, tack), and top-notch facilities in a positive, safe learning environment. Riders new to horses will not only work on riding skills each lesson, but also practice haltering, leading, grooming, tacking and much more during their time before & after lessons. 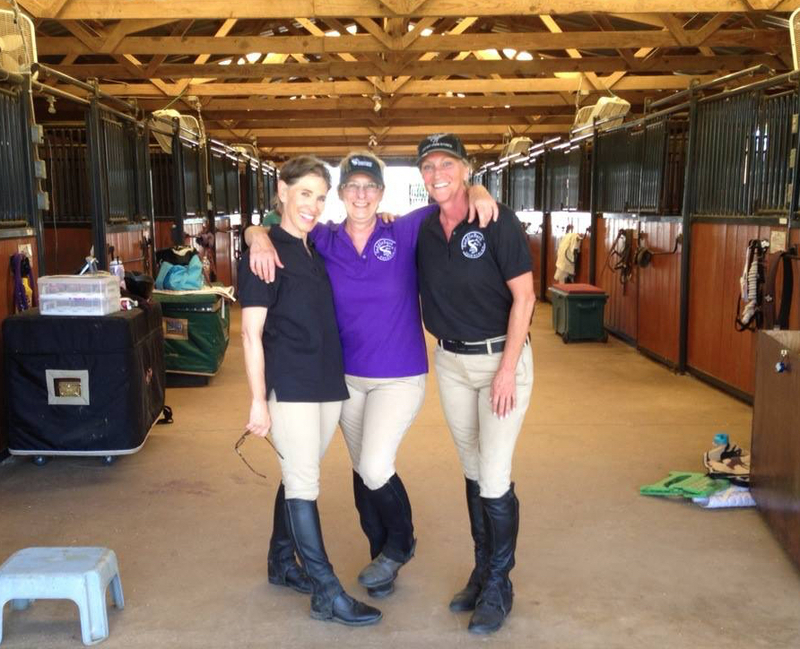 For the more advanced rider, SaddleBack offers lessons in their all-weather jumping arena or dressage ring, on-site clinics, in-barn and out-of barn schooling and Rated shows, and more. Call today to find out why SaddleBack's lesson program is one of the top around. A lesson designed for the smallest member of your family to spend quality time with mom/dad on & around horses. You'll be introduced to safety, ground manners & getting comfortable around horses. Youngsters will learn how to ride (via lead line) with riding commands such as stop, go and turn, as well as how to groom, tack, and feed treats to their school horse--with plenty of photo ops! 1-hour private lesson w/your very own SaddleBack pony, $50. Gift Certificates available for purchase below & mailed to address provided. Contact SaddleBack for other options/amounts. *PLUS Add'l 30 minutes w/horse for grooming, tacking, etc. Hanley has been training at SaddleBack a little over a year now. From her first time on horseback to where she is now has been exciting to watch. What I really like about SaddleBack and her instructor is that my daughter doesn't just show up and ride a horse. Her instructor takes her through the entire process of going to get the horse, brushing the horse, going to the tack room and getting the saddle, pad, bridal and putting it on the horse. Then she gets to ride! When she is done riding she has to put up all the tack, brush/wash the horse and take it back to the pasture. SaddleBack is teaching her life skills that Hanley may not fully understand yet at her young age, but will definitely take with her and appreciate as she grows up. I have always loved horses and it has been a life-long dream of mine (I'm in my 60's) to learn how to ride. Starting in 2012, I had the opportunity to do just that at SaddleBack, and it's been a wonderful ride! The trainers have been so helpful and encouraging in my journey to become an equestrian. Everyone at SaddleBack has been so friendly, and I feel like they are now a part of my extended family. This whole experience has brought great joy to my life!